Since its first announcement or teaser trailer is released into the wild, a game is bound to make certain changes up to launch. But it can be quite revealing to see just what was left out and added into the game by comparing marketing materials to the final product. In this case, coreRoss goes through trailers that were released since the game's official reveal around February of last year. What he finds is a mix of the usual design changes—like a different look for the Tower—as well as what appears to be a few cuts from the game, like Mercury and Saturn locations. Though, it should be noted that these could likely reappear as DLC in the future. These are my main highlights but more in the video. 0:38 "You can go from Earth to Venus to Mars to the Moon, to Saturn"
7:16 Weapons have no level requirement, only weapon levels. A weapon you get at level 1 is just as effective as a weapon at level 20. This means every weapon is a viable option. Meaning you can use any gun you prefer. Giving you a huge selection. 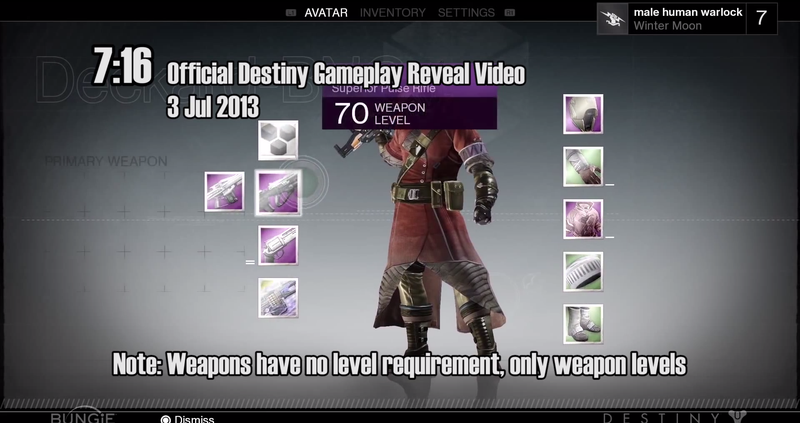 Also this means you can receive amazing weapons even exotics throughout your playthrough from start to finish even on low levels, its a smart way to do loot. 7:15 Thunderlord. Glimmer, Weapon Kit and Talent Point needed for upgrade. No upgrade materials. Maybe get talent points for using the weapon? Much more interesting upgrades. 11:22 Talking to speaker. Different layout on the Tower, we see a different area behind the characters. 11:31 Queens brother asks, "Why is the city breathing down my neck", located on earth. Different voice actor? Seems like a different character too. 11:44 A view of Saturn's Rings rendered in game. 11:46 A ship with Dead Orbit logo. Official Destiny E3 Gameplay Trailer 0:15 Larger view of tower, different layout. Tower has armed guards. 1:11 Strike boss fight, room layout is different. "Help the Crow loot the Academy archive"
The Crow character was first mentioned in a Reddit post detailing an alternative story that was dropped. A new story was created.